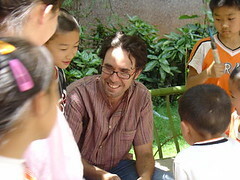 There are 96 posts filed in Kunming, Yunnan (this is page 3 of 20). 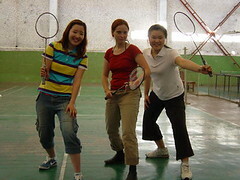 And here’s a nice photo of our incredibly serious badminton team. In Chinese, it’s Yumaoqiu 羽毛球 — feather ball! More photos on April’s blog. For the first time ever, scientists recently captured clear footage of a wild Indo-Chinese tiger in a nature reserve in China’s southeastern Yunnan Province. The researchers used infrared cameras as part of wildlife monitoring and protection project supported jointly by the Xishuangbanna National Nature Conservation Protected Areas Management in Shangyong, Beijing Normal University Institute of Ecology, and the International Species Protection Project. Hey! I noticed a few days ago that some of my flickr photos weren’t appearing on my website. If you’re in China and you may also be experiencing problems viewing photos from flickr. Install this magic addon to Mozilla Firefox and everything will reappear. Thanks to John at Sinosplice for pointing me to the fix! Discussion about the disappearing photos on flickr forum. I talked to my friend April about that poem I memorized. And she had a different take on the last few lines. Of course, I doubt she’s wrong on this one! Here the small leaves of grass are not a metaphor for the child, but in fact refer back to the clothes the mother is weaving/sewing. Meaning, the clothes are such a small token of her love, that although they will remind him of her love, he will eventually wear them thin. The clothes she sews for him so lovingly cannot last forever. Ah, yes. I like that message a little better. The original source of all of these coursepacks is presumably SIT, a study abroad program for undergraduates. Their course syllabi are online (includes full bibliographies of readings). I was just thinking about all those things that are bugging me, things I can only (mysteriously) refer to here as “things not appropriate for blogging.” But I realize that lately I’ve been incredibly fortunate. Last night my friend, Jessie, invited me to dinner with her parents and then we went to an “open mic nite” at a bar. Really lovely people. And although it wasn’t exactly Chinese practice (they are Australians) it was so relaxed and normal. I don’t think I need to remind you, but “normal” isn’t always so “normal” around here. Living in a constant state of being “the other” can really wear you out.